For sure! This hunch was definitely confirmed, when Rose explored in depth what was happening in this empath’s aura. Turned out, over the past few months, she had figured out a new approach to diagnosing her clients’ problems. During each consultation, Lynette would walk around her coffee table once. By the time she made the complete circuit, she’d know a lot about what was going on a client’s body. This new approach was just brilliant, Lynette thought. The knowledge came easily, and was accurate. Only Lynette was paying an unnecessary price for that knowledge. Until Rose explained to her what was going on, Lynette never made the connection. Between how “great” her new approach was… and how this improvised unskilled empath merge was scrambling up her aura. Junking it up with the Imported STUFF that comes from any prolonged unskilled empath merge. Lynette did better by the end of her session. And she resolved to replace her improvised method with safe, tested techniques for doing Skilled Empath Merge. Lynette’ story is hardly unique. Look, as human beings we’re constantly exploring, experimenting, improvising. But when it comes to using your empath gifts to learn what it’s like to be someone else? Please do yourself this favor. And don’t assume that because it’s easy to do an unskilled empath merge… that you’re protected in any way. With all respect, you’re not. As you know if you’ve read Empath Empowerment® Book #1, or Book #2, or Book #3 — slip-sliding into somebody else’s energies can feel good. But it’s bad for you. Clobbering your aura with a long-lasting souvenir: Imported STUFF. And, because any unskilled empath merge happens in consciousness, the problems aren’t immediately obvious. As would happen if you invented a rollie-thing and it was shaped like a triangle. Results that are all good for you. Accurate information, far more powerful than using your empath gifts in an improvised way. What’s The Purpose Of Being An Empath? Being able to learn Skilled Empath Merge! That’s what! Empaths, alone, have the potential to learn Skilled Empath Merge. “But How Can I Safely Turn ON My Empath Gifts Whenever I Choose? By learning Really Effective Skills. 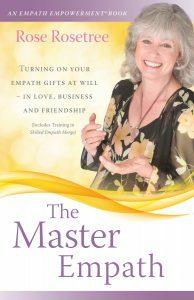 Skills developed by a Master Empath who can help you to also become a Master Empath. Or psychic readings — clairvoyance etc. And free from emotional overwhelm! By definition, every time that you use one of these exciting new skills, what’s sure to happen? While doing that Skilled Empath Merge, you’ll learn about another person. Authentic knowledge that can also be highly advantageous to you…. With this book’s fabulous collection of techniques for Skilled Empath Merge, your practical applications are endless. The goal? Someone who’s not just surviving but living life with greater power, effectiveness, and joy. In short — a master empath. Learning to turn your empath gifts OFF is a blessing. Use this revolutionary book to tap into a whole new world of deep insight, personal power and yes, more fun than you’d ever imagine.